OMG! This book is so awesome. It was so much fun, and even horrific in some places. I love the world, the creatures, the humans... everything! 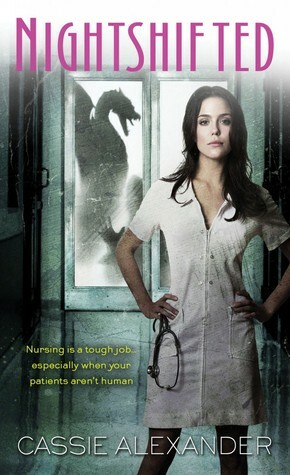 Edie is a nurse in the County Hospital’s Y4 wing, which is where they take care of supernatural creatures. She's completely human and only took the job to save her ungrateful junkie brother. Still, as far as she's concerned a job's a job and she takes as many shifts as she can get. However, the night she kills a vampire while trying to fulfill a dying man's wish, her life is turned upside down. She's got days before a vampire tribunal decide her fate and in order to survive, she gets herself a vampire lawyer and goes looking for the only witness that can help her--a child vampire. Along the way, she meets an alluring shapeshifter and a very helpful zombie. I absolutely loved this book. Edie's a brutally honest character who doesn't sugercoat anything. She takes what she wants when she wants it. If she wants to go on a night out, she pops into the local club and dances the night away. If she's in the mood for company, she'll invite a one-night stand into her home. Her Achilles' heel is her brother, who constantly takes advantage of her kindness and steals from her. I didn't like Jake much, I have to admit. The other characters were awesome. I love the staff at Y4, Ti, Asher, and even the creepy Anna.